The 2018 NHL Entry Draft is in the books. For NHL teams, it is time to reflect on the players they have picked and see if they will make an immediate impact on the organization. As a result of a trade with the Detroit Red Wings, the Vegas Golden Knights did not make their first selection in the draft until the 61st pick in the second round. In the 2017 draft, all of the Golden Knights’ prospects that were drafted were sent back to their junior teams to grow and gain more experience. This draft would prove to be important for the expansion team. With their historical season that saw them in the Stanley Cup Final, they would be in a lower draft position compared to expansion teams of the past, who often have high first-round picks due to their terrible record in the standings. The Knights would decide to strengthen their offence by drafting forward Ivan Morozov with their first pick in the draft. Let’s take a closer look at what Morozov brings to the desert team and how he will make an impact down the road when Vegas decides to utilize its prospect. Morozov has already gained a strong reputation on the international stage. Playing for Team Russia in the World Under-18 Tournament, he scored 10 goals in 14 games. Ivan plays in the MHL, which is the top minor league affiliate for the coveted Russian league, the KHL. During his tenure with Mamonty Yugry of the MHL, he tallied 23 points in 50 games. The young Russian prospect is an effective two-way center who can play on both ends of the ice. He has tremendous speed through the neutral zone and terrific soft hands, which make him a skilled goal scorer. His high hockey IQ gives him the uncanny ability to develop plays out of nothing, giving him the playmaking and vision to be solid on special teams like the power play and penalty kill. 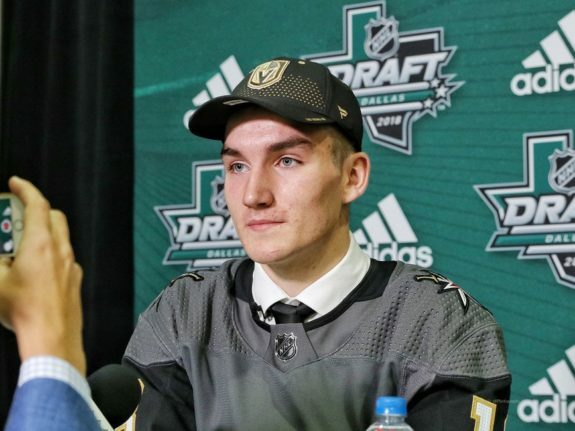 When Morozov was available at the 61st pick, it surprised the Golden Knights front office, particularly Assistant Director of Player Personnel Bob Lowes, who had his eye on the Russian forward at the U-18 World Championships. Vegas head coach Gerard Gallant has preached the entire season that his players compete in an uptempo, speedy style of play. Their mantra of speed and fast play was reflected in their season statistics; they scored an average of 3.27 goals per game (fifth in the league), 32.8 shots per game (11th in the league), had a 21.4-percent success rate on the power play (11th in the league) and were 81.4 percent on the penalty kill (10th in the league). It is clear that the Golden Knights’ draft objectives were to bolster the depth of their scoring. And with acquiring a talented forward like Morozov, who has the agility and quickness to create scoring opportunities, it is a winning hand waiting to be cashed in for the Knights. While there is great excitement surrounding the Golden Knights selecting Morozov, reality sets in; this is a player who needs professional experience before coming to play in the NHL. Ivan got traded to Saint Petersburg of the KHL earlier this year. It is likely that Vegas will send him back to Russia for a year, so he can get stronger, faster and gain more experience playing with top professional talent. Overall, the optimism surrounding the young player from Russia was apparent in the Golden Knights’ management office. 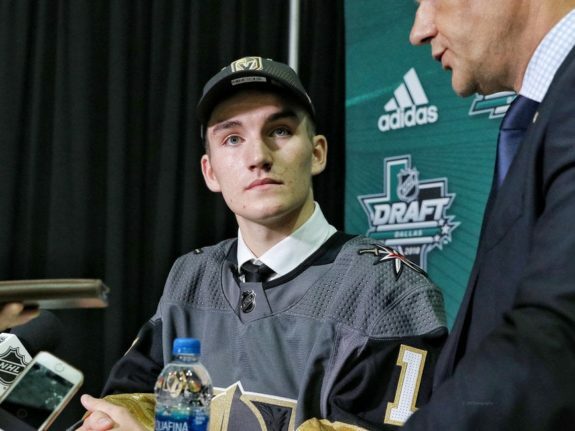 Vegas GM George McPhee was very pleased with drafting the young prospect. It may not be for a few years, but Morozov’s scoring ability will make a resounding mark on the Golden Knights franchise when he plays for them. While his sights are set on the KHL, Sin City will welcome him with open arms when he is ready to be the splendor of the desert.